The industry of men’s grooming is booming. It is projected to reach US$60.7 billion by 2020. Now is the time to make statement that will last. David Beckham, who has been a reference in fashion and style (regardless of the style) has decided to create – in partnership with L’Oreal– a complete collection of grooming products called HOUSE 99. “Grooming is not only about how you look, but how you feel. It’s about being comfortable, trying new things and shaping your next look. I created House 99 to give people the inspiration as well as the right products to try out something different and feel completely at home doing so. House 99 is here to support men, to give them the tools they need to create whatever look they are going for. Purefectly Clean Face Wash | Seriously Groomed Beard & Hair Balm (Pre-Style) | Smooth Back Shaping Pomade | Truly Brighter Eye Balm. 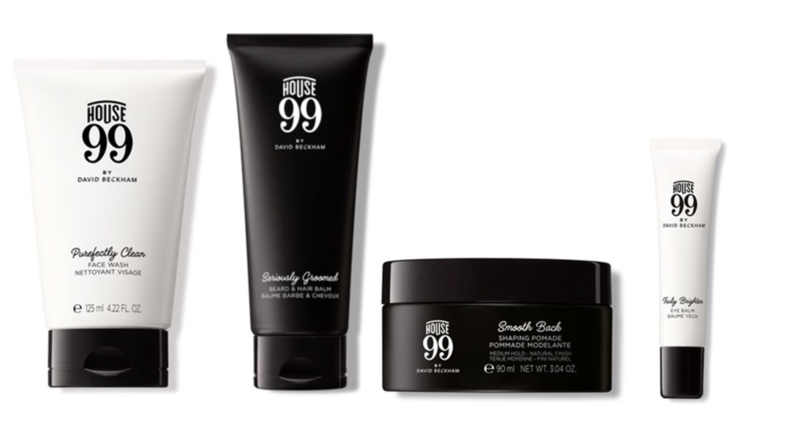 “I’m excited to present my new grooming brand, House 99. For me, grooming is not about how you look, but how you feel. It’s about feeling comfortable, trying new things and shaping your next look. No one needs permission to think about style and grooming. Changing how you wear your hair or growing your beard is a personal decision. House 99 helps you do that. I created House 99 to give people the inspiration as well as the right products to try out something different and feel completely at home doing so. Everyone can experiment and figure out what works for them. When I go to the barber, they expect me to ask for something new. I like keeping up that element of surprise at home, too. Why House 99? The word House because my goal is to build an inclusive community through the brand. And ‘99 because it was a critical year for me. A lot changed in my life that year. I got married, Manchester United won the treble, and my eldest son, Brooklyn was born. I’m really excited about and proud of House 99. We’ve taken our time and done a lot of research to create quality products to help you create the look you want. David has been using these nutrient dense superfoods to gain the competitive edge for years. to bolster your hair & beard and smooth & illuminate your skin. On a side note, spirulina is probably (I mean for sure) the best suplement to take daily.